Game Preview: Battle of Contenders in the Central - The Point Data-driven hockey storytelling that gets right to the point. 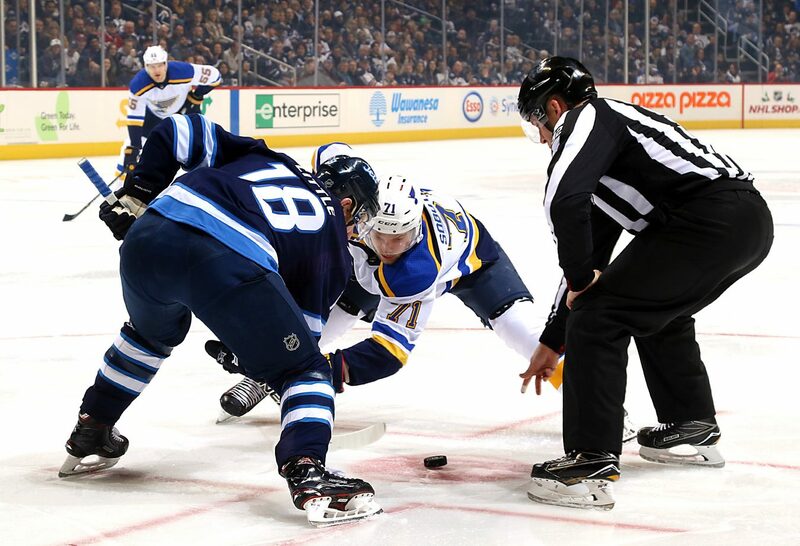 The St. Louis Blues and Winnipeg Jets face-off tonight in a battle of teams seen as favorites to win the division when the season kicked off. 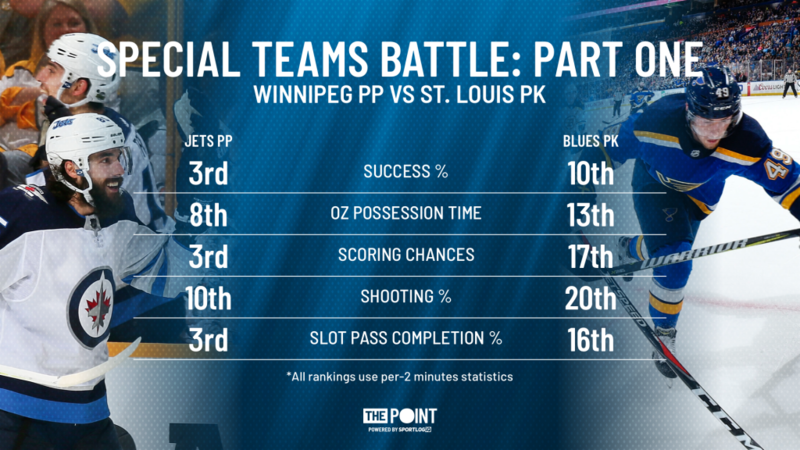 The Jets are off to a strong start, going 5-2-1 in their first eight games, while things haven’t quite gone according to plan for the Blues. St. Louis was one of the busiest teams in the off-season and they’ve started with a disappointing 2-3-2 record as their new players find their groove. Both teams, however, have seen strong performance from both their special teams units. So, we will see a pair of top-10 powerplays face off against a pair of top-10 penalty kills, tonight. Who will come out on top? Let’s break it down. First off, the Jets man advantage against the Blues penalty kill. As expected, the Jets are a force when up a man. They rank top-10 in many key metrics and with all the talent they have, they should be able to continue on their path. It’s another story for the unit that will try to stop them, however. Despite ranking top 10 in efficiency, the Blues’ underlying numbers don’t suggest a team that should be this capable stopping their opposition. They look more like a middle of the pack team in most of our key performance indicators. Interestingly enough, four of the Blues’ seven games have been against teams that fall in the bottom 10 in powerplay efficiency (Montreal, Chicago twice, Calgary), but they’ve also faced the Jets and Maple Leafs once each, both ranking top 3 league-wide. Interestingly enough, the story is similar when we flip the script. The Blues powerplay performance is backed up by the data. They generate a lot of chances, control the puck and direct a lot of pucks to the slot, all things indicative of sustained success. 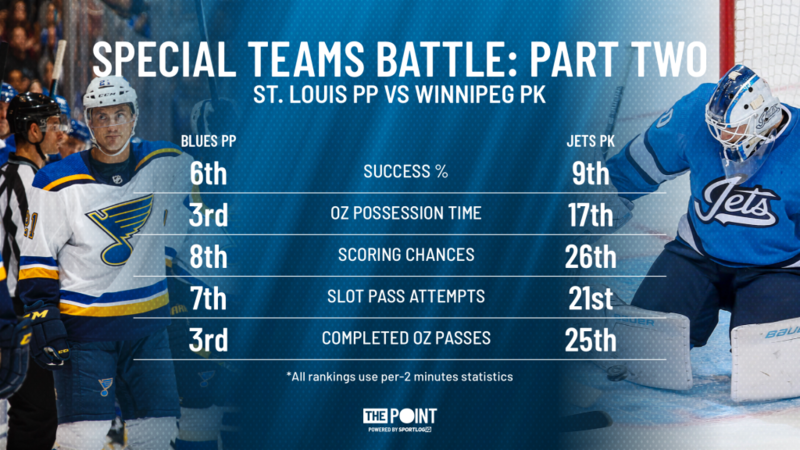 The Jets penalty kill, meanwhile, has even more trouble limiting their opponents ability to create offense than St. Louis’ unit. The big difference is that Winnipeg has Connor Hellebuyck to mop up the mistakes they make. Hellebuyck helps them allow the 5th lowest shooting percentage to opposing powerplays, boosting their performance higher than the numbers indicate it should. A special team battle that features two great powerplays and two shorthanded units that are outperforming their underlying numbers is a recipe for offensive fireworks. Something to keep an eye on if you’re tuning into the game tonight.